Hudson Taylor prophesied the last, great revival would begin in Eastern Europe . . .
David Hathaway, a British evangelist, believes the revival is already underway in Russia. Hathaway said Taylor's prophesy included Ukraine and "...other former Soviet nations..." He added that the revival would "...spread to Europe." Has the great revival already reached Ukraine? GNS' Brother John believes more people have come to the Lord in Ukraine in recent years than in any other European nation. 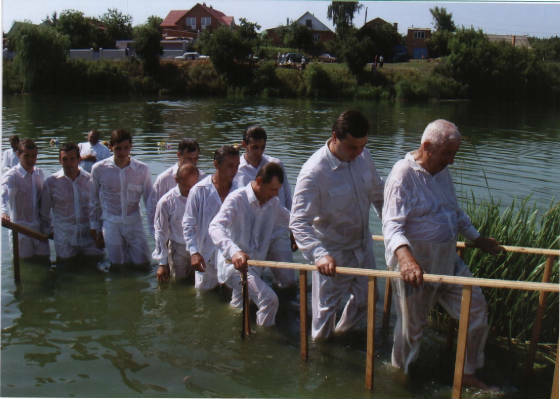 Each summer the rivers of Ukraine are full of new believers being baptized. The fires of revival are only increasing the already critical shortage of Bibles - particularly for new believers. Because of the much lower cost, New Testaments are given out to many seekers at crusades and evangelical outreaches. But more costly Bibles must be reserved for newly baptized believers. Despite the "rationing" of Bibles, there are still not enough to go around. The fires of revival are filling churches throughout Eastern Europe, but particularly in Ukraine and Russia. These new believers, including many children and teens, desperately need Bibles to grow in their faith - and to help them through their trials. Yet many men of God believe the window of opportunity for the Gospel may soon be closing. To stay up to date on this rapidly changing situation, sign up for the complimentary GNS Newsletter. Your new brothers and sisters in Christ will be "eternally grateful." To receive your Free Newsletter Subscription, click on the "Newsletter..." tab above.